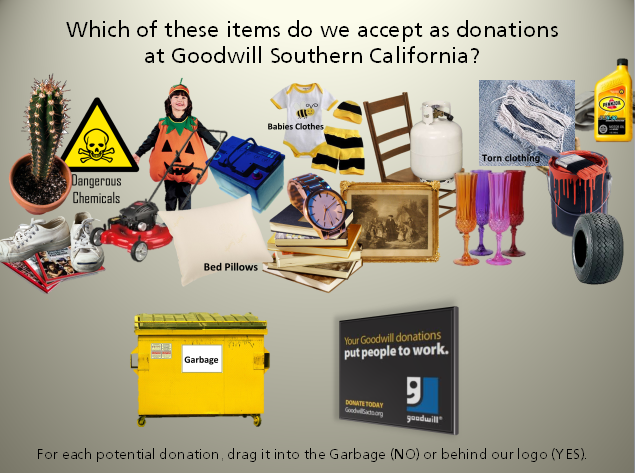 1) I've created a drag & drop activity that features some of the items we do & do not allow for donation at our Goodwill. Is there a way to have specific response after each item is selected (either right or wrong) that explains a bit more about why that item can or cannot be donated? It doesn't look like there is a way to assign answer level feedback for free form drag and drop questions, only question level. Also agree that there are no default options to have the object disappear once properly dropped. I was able to achieve the same affect by adding a "Drop Correct" state to my draggable objects, and for that state I deleted the image, making an "empty" state if you will. Then I was able to assign a trigger to the object instructing Storyline to change the state of my object to "Drop Correct" when the object is dropped on my drop zone. I developed an activity recently with 15 drag and drop items. For the purposes of feedback, I had them take the test (drag and drop), and on the next slide, I had them click the item for specific feedback about each item, which I provided in callouts as that would hide and appear as the items were clicked. I am anxious to hear if you can get an item specific feedback solution. "Hello Karen, It doesn't look like there is a way to assign answer l..."
Can I add a one item to each drop target when I am not in freeform?